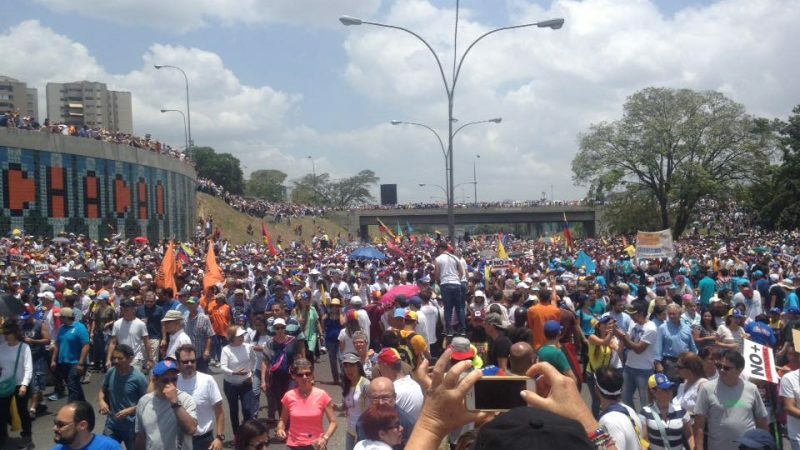 Global Voices · What Is Happening in Venezuela? 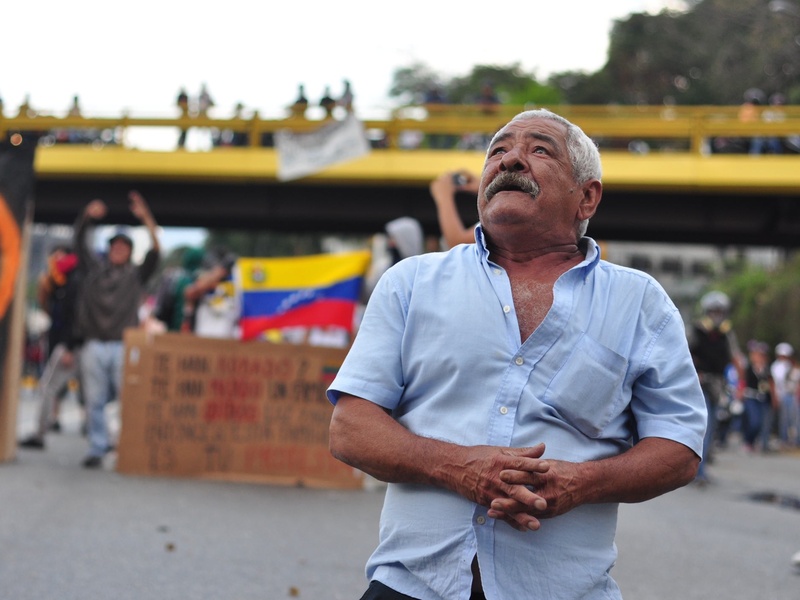 A man looks upward during protests in Venezuela in 2014. The country had experienced turmoil long before the most recent political confrontation between the National Assembly and the Supreme Court. Photo by Flickr user andresAzp. Published under CC 2.0 license. Listen to the special episode of our Into the Deep Podcast: “Out of Venezuela”. Dictatorship is the word many Venezuelans have been using to describe the last few months of political turmoil in their country, which reached a peak on March 30, 2017, when the Supreme Court of Justice effectively nullified the National Assembly. The move sparked protests and caused international outrage. Some described it as a “self-inflicted” coup. For many Venezuelans, it was confirmation that their country had lost any semblance of democracy. The Supreme Court assumed the role of the National Assembly and permitted President Nicolas Maduro to take over some of the functions of the legislature, but this was short-lived — the court reversed course days later after President Maduro asked it to reconsider its decision. Despite the reinstatement of the National Assembly, organizations inside and outside the country are not content. Protesters continue to mobilize almost daily and in large numbers, even when confronted with police aggression. Notwithstanding the recent revision of some elements of these decisions, it is essential that the Government of Venezuela ensures the full restoration of democratic order. The incidents of the last few weeks are merely the latest in a series of restrictions limiting the powers of the National Assembly since Venezuela's political opposition won two-thirds of the seats in the December 2015 elections. In January 2016, the Supreme Court suspended the elections of four lawmakers — three affiliated with the opposition and one with the ruling party — from Amazonas state for alleged voting irregularities. The outgoing National Assembly controlled by Maduro's United Socialist Party had installed judges that were sympathetic to the government, and the opposition accused the court of trying to strip them of their super-majority — which, among other things, allows them to remove Supreme Court justices. The opposition then went ahead and swore in three of the lawmakers in question. In response, the Supreme Court ruled that the entire National Assembly was in contempt and all decisions it made would be null. Legislators were also left with budget cuts and were barely compensated for their work for more than 10 months, with a salary of as little as $38 dollars a month. In January 2017, the National Assembly — still considered in contempt — voted again to declare that Maduro had “abandoned his post” and to demand new elections. After the National Assembly refused to greenlight the country's state-run oil company forming joint ventures with private companies, mainly from China and Russia, the Maduro government went to the Supreme Court, which then ruled not only that legislature was still in contempt, but that it would be assuming legislative powers. To the casual observer reading headlines in international media, Venezuela has grappled with a crisis for the last several years, and the Supreme Court's short-lived ruling is just the latest development. However, Venezuela doesn't have one crisis. It has many crises, all of which are interconnected and affecting ordinary Venezuelans. The first is political. The late Hugo Chávez, who died in 2013, handpicked President Nicolás Maduro as his successor. Maduro says he is trying to further Chávez's socialist Bolivarian Revolution, which was meant to bring democracy to the people and alleviate the high levels of poverty among Venezuelans. But Maduro has not commanded public support and respect at the level of his predecessor. Amid a three-year economic crisis and record levels of violent crime and poverty, Maduro's popularity has dipped to its lowest point of the last few years. He also has been accused of using authoritarian methods to stop dissent. His government has suppressed protests, censored the press and curtailed free expression. Opponents, critics, and journalists whose reporting puts the government in a negative light face imprisonment. Some have gone into self-imposed exile. Others have simply gone silent. Demonstrators in Caracas on April 7, 2017. Photo: Luis Carlos Díaz. Used with permission. Venezuela's political opposition has been represented mainly by the Democratic Unity Roundtable, a coalition of different parties spanning left to center-right. However, many Venezuelans distrust parts of the coalition, which includes figures who were active in politics decades ago, when poverty was crippling and large swathes of the population were disenfranchised. The coalition has brought together many groups and political parties that were in conflict, but there are still struggles for power as well as disagreements over ideology and policy. Furthermore, in the context of recent protests, not all the protesters are marching behind one single political party. Some of those in the streets are supportive of specific opposition factions, while others are interested in general democratic principles and economic rights. Politics has a way of seeping into all aspects of life in Venezuela, but people's most pressing needs typically hinge on the economy. Maduro's administration has been marked by a deep economic crisis. The country is dependent on its oil revenues, but oil prices have fallen in recent years, and the system has not been able to compensate for these losses. Venezuela's inflation rate, which has been over 50% since 2014, reached 800% at the end of 2016 and continues to rise. Meanwhile, currency controls have limited imports, putting a strain on supply. The government controls the price of basic goods, but the black market still has a powerful influence on prices. Prices on basic goods can soar in a matter of days, and the national currency can weaken with the same speed. What this can mean for ordinary Venezuelans is hunger and shortage. This food insecurity can be seen in the long lines of people inside and outside supermarkets and the attempts to cross the border with Colombia to buy basic goods. While numbers on the food crisis are not conclusive, they have sparked looting and a very visible change in Venezuelans’ daily food routines. The government and certain media outlets deny that there's a risk of famine — something that has been feared in certain parts of the country — and qualify the alarm as part of a smear campaign against them. However, non-governmental organizations say they can't qualify the extent of the problem because of a lack of proper data. Over the last few years, during which time both poverty and the economic crisis have worsened, Venezuelan officials haven't presented updated information. For Venezuelans, staying informed of all that's happening in their country can be difficult. The right to information is under threat with the government's growing control over media, a trend that's difficult to counter given Venezuela has some of the slowest and most precarious internet connections in the region. Inside a media environment marked by rumors and politicized attacks from both sides, citizen media has become one of the most important sources of information regarding protests and crackdowns. Even websites that report on things like the economy and value of foreign currencies have become a critical resource and thus have become a target for political censorship. Venezuela also suffers a health crisis, which is one of the most turbulent debates taking place inside the South American country at present. A shortage of medicines and the poor condition of facilities, as well as the marginalization of indigenous communities, has had deadly consequences. Venezuelans have resorted to social media and the support of others in order to obtain the pharmaceuticals they need. Violence has also spiked in the last decades. Venezuela's murder rate is among the highest in the world. The problem has some Venezuelans, especially in urban slums, praying to criminals instead of saints. Niños jugando libres en la calle, cantando y riendo, dueños de los espacios, así como lo mostramos en este video queremos que suceda en cada comunidad de Caracas y del país. Nuestro objetivo es la disminución al mínimo de la violencia a través de la prevención, creando una ciudad de la convivencia. Children playing freely on the street, singing and laughing, owners of the spaces. What we see in this video, we would like to see in every community in Caracas and the rest of the country. Our goal is to decrease violence to its minimum through prevention, creating a city of coexistence. Despite efforts like these to improve the situation, the challenging reality has pushed waves of Venezuelans to leave the country. Meanwhile, in the political arena, each party blames the other while these crises only worsen.